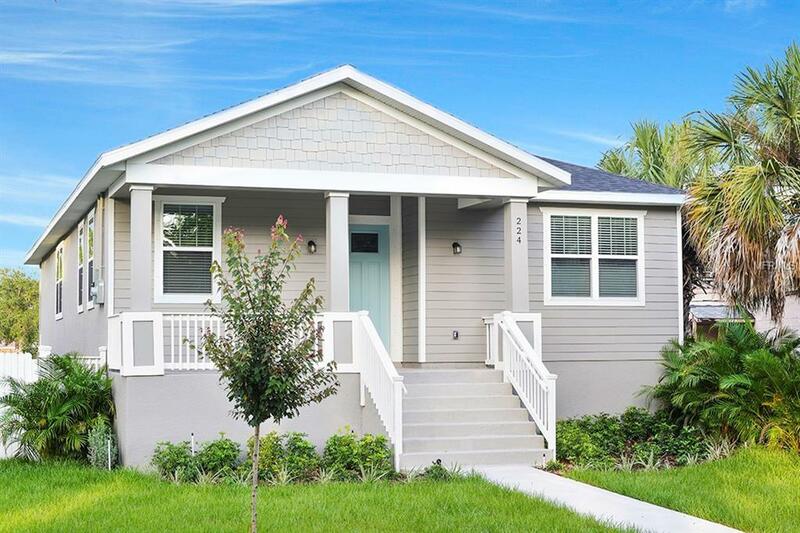 Luxurious 4 bed 2 bath Brand New Home Available now in North St. Pete! As soon as you pull up to this home you are greeted with beautiful landscaping including new sod, palm and oak trees, and an irrigation system. Walking through the door you will notice the luxurious finishes: ceramic tile flooring which looks like wood flooring, crown moulding, high ceilings and an open concept living / dining / kitchen layout. First bedroom you will see can be used as an office or guest's room. Off of the living room you enter the master suite. You will be captivated by the size of the room and the master bathroom; finished with marble flooring and shower, glass shower door, dual sink vanity, separate toilet room and a large walk in closet. This is a true escape! Kitchen is fitted with stainless steel appliances, quartz countertops, a spotless design with closet pantry, huge island, subway tile backsplash with under-cabinet lighting. Right off of the kitchen are 2 additional guest bedrooms separated with an adorable guest bathroom finished with marble floors, marble shower / tub, and dual sink vanity. Inside utility leads you to the attached 2 car garage finished with apoxy floors with an attic access. This home can't be missed. Schedule a showing today! Listing provided courtesy of Direct Express Realty.